Gheorghe Costinescu, Romaninian born-and-bred, student of Messiaen and Stockhausen, Berio, Ussachevsky and Chou Wen-chung, New York resident since 1969. . . and composer of note. I have had the opportunity to experience his DVD Jubilus & Pantomime (Ravello RR7822), and I am glad of it. The program centers around a retrospective concert given at Columbia's Miller Theatre and the performance of two of his chamber works, "Jubilus" and "Pantomime," by the Ensemble Sospiso under the direction of Costinescu and Rand Steiger, respectively. The in-concert performances are shown, followed by a discussion of the "Pantomime" score by the composer and, finally, a lengthy interview. Costinescu's works on the DVD are quite theatrical and visual as well as aural. This music itself is post-serialist and architecturally intricate, filled with dynamic interplay and contrapuntal complexities. The music in itself is top-drawer modernism. With this DVD, however, we get to experience the visual impact of the performances, which is considerable. "Jubilus" is rather short but quite dense. It is scored for vocalist, body percussionist and trumpet, who together create a tightly woven music of phonemic-pitched vocal utterance, a complicated series of coordinated hands, feet and mouth on the part of the percussionist to create an avant sort of pre-beat-boxing melange, and an intricate, wide-ranging trumpet part. The aural result is fascinating as is the visual imagery of the three in performance. "Pantomine" is longer and considerably more involved in the visual and musical sense. It is a work for small chamber orchestra that calls for various coordinated movements of the non-stationary players across the stage. They circle, cross each other, assume various positions and clusterings and otherwise enact a kind of elemental ballet as they play their parts. The music has aleatoric elements and moments that are rigorously notated. The stylistic dimensions vary from serial preciseness to a kind of communal anarchy of shifting motifs, and on to a rather lovely chorale passage towards the end. As the illuminating discussion of the score makes clear, there are quite precisely conceived "choreographies" of movement built-in to coincide synchronously with the musical simultaneities of the score. It is in that sense a logistical feat to give a spirited and faithful performance of the work. That's most certainly what happens here. On first experience the various shifts in position seem puzzling. Do the movements add to the appreciate of the performance event? The answer for me at least has been, yes, once the interrelationships of movement and sound are understood more fully. The ensuing discussions with the composer are quite revealing. He is a prototypical avant gardist in that there is a strong conceptual element in his music, something that enlightens listeners when brought forward through discussion. Costinescu and the directors of Ensemble Sospiso make all that up-front in the ensuing dialog. 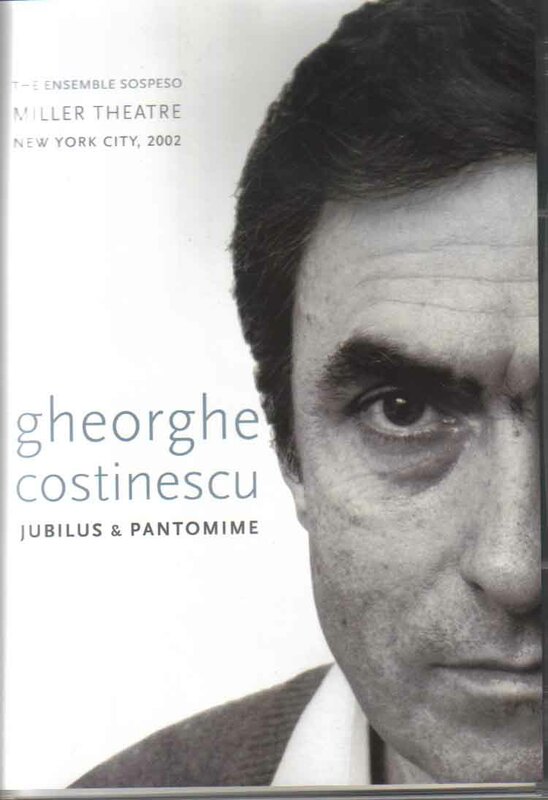 In the end Jubilus & Pantomine takes full advantage of the DVD medium to bring you some important Costinescu works in performance with all the critical visual elements in play. It also makes for a lively mini-portrait of Costinescu the man, the conceptualist and the composer. 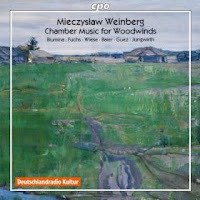 A hot Monday morning in the season and we return to the corpus of Mieczyslaw Weinberg's works for a fine disk of Concertos (Chandos). Thord Svedlund conducts the Gothenberg Symphony Orchestra for a notable grouping of four: the "Fantasia," op. 52 (for cello and orchestra), Flute Concerto No 1, op. 75. and No. 2, op 148, and finally the Clarinet Concerto, op. 104. These are four works that stand on their own. The "Fantasia" has some extraordinarily memorable melodic work in the cello, well played by Claes Gunnarsson. 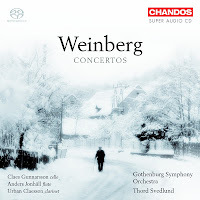 The second Flute Concerto is modern sounding in Weinberg's own way, which in this later period shows a synthesis between the general Russian modern milieu and his own originality. There are bittersweet flute passage of beauty and Anders Jonhall brings out his part with a projecting presence and fine tone. The first flute concerto begins with a rather frenetic romp at breakneck pace, follows with an evocative slow movement and a dance-like finale. It's perhaps a bit more whimsical than the second and that gives the music some welcome contrast. The Clarinet Concerto has a very bravura clarinet part and a bit more dash and stridency than the other works. Urban Claesson heightens the built-in contrasts and handles the various articulations with poetic grace. We talked about Ola Gjeilo's piano improvisation disk recently on these pages (see below). 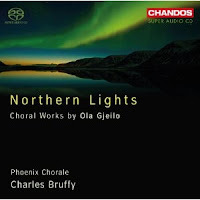 Now we backtrack to an earlier disk called Northern Lights (Chandos), where the Phoenix Chorale under Charles Bruffy perform a number of his choral works. This is a kind of post-minimalist lyrical music. The chorale sounds marvelous a capella or with the accompaniment of string quartet, piano, etc. The music is enchanting and moving in a way that no doubt has had wide appeal. Ola writes for the chorale with a sure hand, taking advantage of vocal ranges and their special qualities to map out an otherworldly vocal landscape. This is not in any way avant music so much as pleasing and sometimes very moving sonances that bring to the forefront the beauty of the human voice. The "East meets West" idea has been with us for ages, of course, but in music it is not the norm. A real interpenetration of musical cultures is not always an everyday happenstance. And of course there are degrees of success in the music making situation, as there are processes of exchange between musical cultures that can happen over long periods of time. The music of Marty Regan is something special because he achieves a most interesting synthesis and gives us some very enjoyable music at the same time. His second volume of "Selected Works for Japanese Instruments" is out. (I covered the first volume, Forest Whispers, on my Gapplegate Guitar blog on October 14, 2010.) Magic Mirror (Navona 5876) in many ways begins where the first volume left off. It's music that uses traditional Japanese instruments like the shakuhachi, shamisen, koto, biwa lute, etc., for a music that has much of Japanese tradition built into it, but also has personal compositional ideas and juxtapositions that have a Western heritage. The most obvious place you'll hear that is with the piece for four shakuhachi, "Flamefox," or the piece for shakuhachi and string quartet, "Voyage." In both works Western harmonies and avant/traditional Western classical elements freely intertwine with Japanese musical sensibility. That's true to some extent throughout the album. And it can be quite subtle, for example with the interjection of long-toned Gagaku sounds with other elements on the title cut. 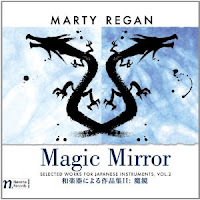 It's another worthwhile effort from Maestro Regan, a very enjoyable, substantial musical repast. Regan gives us innovative writing that seeks to discover new relations between and within traditions. It succeeds! We reviewed something by Scott Miller several days ago here (see index). Today, another. It's Scott on computer-interactive live electro-acoustics and Pat O'Keefe on clarinet, for a CD called Willful Devices (self-released). The finished product is a series of compositions by Miller utilizing interactive electronics, and improvisations, both structured (frameworks composed by both artists, respectively) and free. The title sums up the idea that computer interactive programs often have a will of their own in the way that they respond to sound-music stimuli. They here become a third variable, a third creative force in the generation of musical results. The pieces have an overall ambiance and sound staging so that the improvisational, the composed and the computer derived aspects of the aleatory all run together in a continuum. Music from Minnesota is what you might call it. But of course not just any old music. Pat O'Keefe is a most adventurous player, fleet and very attentive to the sound color possibilities of the clarinet, be it conventional tone, harmonics or expressive phrasing. Scott Miller creates an electronic orchestra of sorts; but not a sonic equivalent of a conventional orchestra as much as a wide but related spectrum of electronic tones and colors that blend together and with the clarinet and its electronic alteration in totalized ways. His sonic palette reminds at times of the classic electronic phase of Stockhausen, not in sound-structure per se so much as total impact. This is high adventure avant garde music of the best sort. It is sonically advanced, musically intricate and most pleasing in an avant sort of way. Recommended. Arianna Savall made a reputation as the vibrant singer with the early music ensemble led by Rolf Lislevand, on Nuove musiche. She teams with Petter Udland Johansen for the album Hirundo Maris (ECM New Series B0016978-02). The title means "sea swallow." Savall and Johansen conceived of the album as a kind of musical journey from the Mediterranean to the North Sea, in a series of old chestnuts and original songs that run between folk and early music in engaging ways. It's a fascinating ensemble combining the vocals and folk harps of Savall, Johansen's vocals, fiddle and mandolin, and three additional ensemble members who variously sing and play guitar, Dobro, double-bass and percussion. You get a rather marvelous collection of songs, beautifully performed. Aside from the originals there are traditional Sephardic songs, Catalan songs, Norwegian folk, the Scottish song "the Water is Wide," and others, all done in more or less early music troubadour style with a small string ensemble conceived in traditional yet also innovative ways. There are touches of ethnic percussion as it appeared on the crossroads of cultures at the edges and there is an overall luminous ambiance to it all, as you might expect from an ECM recording. It's very lovely music, timeless and timely, performed with style and feeling. 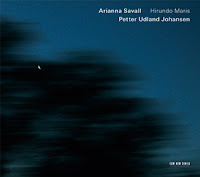 Arianna's voice is quite terrific and Petter has a pleasing voice as well. They blend together in harmony or strike off on their own from song to song for plenty of contrast. A beautiful album that I recommend highly. The recording today does not fit in easily with expections. 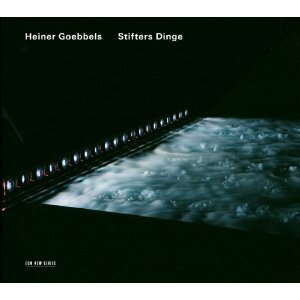 Heiner Goebbels for his Stifters Dinge (ECM New Series B0016967-02) had five grand pianos mounted together on end, and pulled through a number of pools of water while digital devices activated the strings like a set of player pianos. Then through various other mechanical means unconventional sounds from inside and outside the instruments were obtained. Prerecorded voices of New Guinea tribesmen, William Burroughs, Malcolm X, Levi-Strauss, etc., further combine with natural and what sound like electronic alterations of natural-industrial sounds (but are most likely piano-mechanical based). There are original music vignettes that the composer produced as well as quotations from other works (such as Bach's Italian concerto). The work is named after writer Adalbert Stifter (1805-1868) who compiled a comprehensive catalog of natural sounds. The ultimate effect is a rather uncanny combination of text-sound piece, collage, soundscape, electro-acoustic melange and work for five mechanical pianos. No one category makes sense of it, except perhaps music-sound-site installation, which has a rather inelegant ring to it. What is uncanny about it is the strong feeling that all elements come together to create a kind of sound poem whose meaning does not seem able to be expressed, yet rather clearly lurks below verbal articulation. Regular machine-like industrial, natural, and human (voice and music) sounds combine in a landscape that divides into more or less discrete event horizons, yet does not signify in any conventional sense. The overall effect is of a narrative in sound, an excursion into abstract hermeticism, a journey to an unknown zone. It is, ultimately, haunting and original, alien yet accommodating, an aural puzzle that does not easily give up the key to its solution, if at all. It will in this way puzzle the listener, enthrall, provide a total immersion, a total aural conundrum. And of course that will either satisfy and intrigue, or, if you do not surrender to it, frustrate expectations and confuse. For me the former prevailed. In that it makes for the best sort of "new" listening experience. 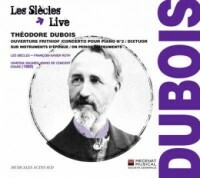 Theodore Dubois (1837-1924) may not be familiar to many. He left behind a rather considerable body of works and was a prominent pedagogue in his day, teaching Dukas and Schmitt, among others. Les Siecles under Francois-Xavier Roth has recorded a disk of Dubois orchestral works (Musicales Actes Sud) including his Second Piano Concerto, the Ouverture de Frithiof, and Dixtuor, a four-movement work. It reveals a vigorous (late) romantic with a thematic developmental prowess (in "Dixtuor" especially) that appears now and again at various points throughout the program. The Piano Concerto is well-crafted but perhaps not entirely overwhelming in its impact. It is well played by Vanessa Wagner as soloist. The "Overture" and "Dixtuor" have the most to offer to my ears. Les Siecles does a fine job, particularly in that this is a live recording. At this point I would have to say that the disk will appeal to the more die-hard of romantic aficionados. Others may find it less indispensible. A pairing of Witold Lutoslawski and Bela Bartok isn't a big stretch. After all, they were both Eastern European, both lived and worked in the 20th century, each in their own way were modern innovators, and Bartok was a major influence on Lutoslawski. But it works especially if the program leads off with "Musique Funebre," written by Lutoslawski to commemorate the 10th anniversary of Bartok's death. 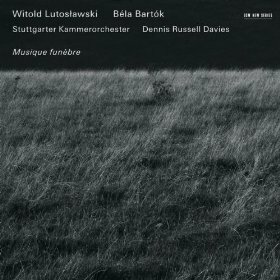 And so we have the program to consider today, a CD named after the Lutoslawski work, Musique Funebre (ECM New Series B0016957-02), performed by the Stuttgarter Kammerorchester and the Hungarian Radio Children's Choir, Dennis Russell Davies conducting. The press sheet that came with this disk notes that "Musique Funebre," a UNESCO Prize-winner in 1959, marks the achievement of Lutoslawski's musical maturity, and that it bears a genetic relationship to Bartok's "Music for Strings, Percussion and Celeste." I concur; one can hear the resemblance. Davies' version brings out the mournful qualities with a low-key flourish and sets us up for the mood change that follows. Bartok's reworking of Transylvanian folk materials, "Romanian Folk Dances" bring us closer to the earth. The arrangement for string orchestra by Arthur Willner makes for lively and enlivening fare, especially in the hands of Davies. Bartok's "Divertimento" BB 118 takes us into a realm related to "Musique Funebre," with serious and somber eloquence, but then a final movement that has a folk-dance quality. The seven pieces from "27 Two-and Three-Part Choruses" BB 111 adds the Hungarian Radio Children's Choir for more folk-based brilliance. These are lovely, somewhat neglected songs and the performances are nothing short of wonderful! 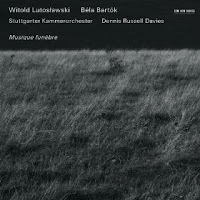 So there you have it--a kind of alternation between the somber and the earthy, the question of influences, some somewhat unstandard juxtapositions and an excellent series of performances by Dennis Russel Davies and the Stuttgarter Kammerorchester. It's a good bet that if you read this column regularly that you will appreciate the disk. The repertoire from the middle ages and beyond, known generally as "early music," lives and breathes today in renewed glory thanks to a series of dedicated and talented practitioners and a creative sympathy with the music as reflected in a stripping away of the veneer of succeeding ages in modern performance practices. To put it another way, 100 years of innovation and experimentation in sound color (both acoustic and electronic) has enabled us to rehear early music in ways that paradoxically come closer perhaps to the original context yet also resonate with modern music as it has come to fruition in the past several decades. 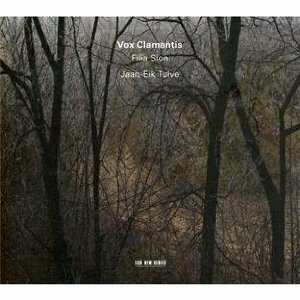 That is most certainly true of the Estonian vocal group Vox Clamatis under director Jean-Eik Tulve. They divide their performance time between contemporary avant-early composers such as Arvo Part and the early repertoire itself. It is to the latter they turn on the new release Filia Sion (ECM New Series B0016956-02). The ensemble sees a special focus, a more intensive blend of vocal sound and color as primary to their mission. The repertoire of Gregorian monophonic chant, drone-centered conductus and early polyphony are uniquely suited to their musical sense, and vice versa. The theme of the works center around the Daughter of Zion, Mary in the middle-age New Testament derived view. Some beautiful Gregorian Chant, a Perotin conductus (with added overtone throat singing!) various rather obscurely anonymous or lesser-known post-Gregorian works and a Jewish chant make up the program, which is sonically archaic in the best sense. It's an album that revels in the sort of musical space that ECM has continually excelled at--a cavernous cathedral ambiance, the vocal parts blended with creatively affective attention to sound staging, and a marvelous vocal ensemble sound. This is music to take you to another spacetime. The taking you there paradoxically has become one of the hallmarks of later modernity, both in performance and new composition. The excellence of the ensemble and of the recording recommends itself to all who appreciate the sonics of early music. It's continually there on this one, with beautiful results. 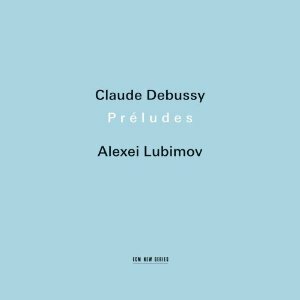 What sort of pianist excels at Debussy's "Preludes"? One with facility, of course, but tempered to the extraordinary mood painting of Debussy's seminal work. Someone who can get to the essence of each miniature and bring that out with the sort of hazy clarity the work suggests. A keen ear for the modernism-within-tradition that the work embodies. A player with subtle, impeccable touch, the dynamic range of a symphony orchestra. Someone with excellent interpretive sensibilities, a poet of the pianoforte. That describes Alexei Lubimov on the new 2-CD set covering both books of the Preludes (ECM New Series B0016958-02). Add Manfred Eichner's vivid sound production and there is magic to be heard. The "Preludes" have a special character. Singingly lyrical, harmonically ravishing, contemplative and driving in turn, so suggestive of associations yet supremely abstract, early modernist in its movement away from chromatic romanticism toward a thoroughgoing sound color palette, the works are prophetic of the music to come in the century, yet place themselves front and center as a completely integral, self-actualizing language of sensuality and sensation. All these qualities Alexei Lubimov brings to the music, reveals as always a part of the music, puts forward as his embodiment of the music. 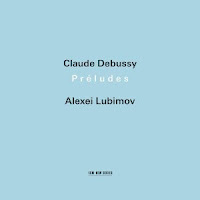 Lubimov speaks the language of the "Preludes" with a poeticism that does full justice to the music. 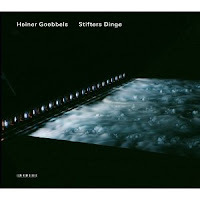 He shines and sparkles with evocations of mystery when called for; dazzles the ears with the more extroverted passages of emotive power; brings us back to solitary reveries in a twinkle, and reintroduces the motion and traversal of aural landscapes once again, making the contrasts seem sensible, inevitable yet still wonderfully alive. The set includes both books of preludes plus the piano version of "Prelude a l'apres-midi d'un faune" and the lovely "Trois Nocturnes." It is Debussy put across the way he would have appreciated. Not too sentimental, not too bravura, not too romantic, and with a good projection of the work as the innovative, boldly new music it was at the time. This is a near ideal realization of the masterpiece-landmark it is, a highly sympathetic reading of the extraordinarily fertile and subtly expressive vehicle of brilliance it remains today. A reveling, a revelation, a revealing, a finely detailed performance. This is a version to live with like a comfortable piece of furniture, exquisitely made yet designed to become ever more integrated with your life the more familiar with it you become, the more you use it, so to speak. Ravishing performance! The use of recent history as the subject matter for vocal works has continued since the days of Nixon in China. 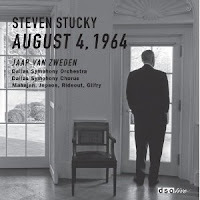 The latest, first performed in honor of the 100th anniversary of the Dallas Symphony Orchestra, is August 4, 1964 (DSO Live 4). The music is by Steven Stucky; libretto by Gene Scheer. The Dallas Symphony Orchestra and Chorus, with soloists, is conducted by Jaap van Zweden. This is not an opera--there is no staging. They instead call it a concert drama, which fits. It is all about a fateful day in the presidency of Lyndon Baines Johnson (August 4th, 1964). The drama centers around the unfolding of incidents that serve to dramatize Johnson's tenure as a whole. Specifically it covers from the perspective of the White House the ambiguously flawed communications and radar malfunctions that lead to the Gulf of Tonkin incident--the American bombing of the North Vietnamese in response to an attack that never took place. At the same time a series of civil rights crimes--racist murders--came to light in the south, Johnson met with cabinet members on his War on Poverty, and, to add some reflection, Johnson mused on his place in future history and the war, the latter of which come from sources not directly tied in with that day. The libretto is made up of transcripts of communications from that day, Johnson's autobiographical musings, along with additional dramatized excerpts from various sources by those involved, a related poem, etc. It is a full-fledged treatment with full orchestra, chorus and soloists, with action, an orchestral interlude and meditative soliloquies on the mostly tragic events of the day. It shows LBJ as a complex, flawed character, a man with a large ego, wanting to do good, to do the right thing, ever aware of the judgement of posterity, never quite able to grasp the full impact of his Vietnamese commitment until it was far along and too late to turn away from. This is LBJ the full supporter of equality and the fight for civil rights, a champion of the poor, yet primarily remembered for his Vietnamese miscalculations. By default, this day stands out as the bungled beginning of the Vietnamese escalation, a response to a nonexistent attack. The music and libretto combine to capture the tragedy of the era, LBJ's spotty legacy, his human frailties. It is musically effective--moody and frenetic in turns. Given the subject matter, it does not have a great deal of hoopla built into the score--no grand night of toasts as with Nixon in China. The chorus does not function so much as a crowd as a Greek chorus, commenting and interjecting, expressing a mood. It is not a work that has a great deal of crowd-pleasing, entertaining huzzas. But the theme of that day sets the tone and it would be out of character for these sorts of things to be dropped in willy nilly. These were extraordinarily difficult times to be president and the tone of the work tries to capture that feeling. The performers under van Zweden acquit themselves quite well. Stucky creates music that well-fits the moments portrayed. I found it all tragically moving. Those were times of great struggle and sacrifice, in some cases for causes that remain with us very much, in other cases for objectives that turned out to be outmoded in time, out of our grasp, out of reach, a flight after a chimera with tragic consequences. A sad time, a stirring time, and a musical drama that captures both, and the larger-than-life persona of LBJ, himself center stage, the central tragic figure of the action that day. This may not be the masterpiece musical drama of the century, but it deserves your serious attention. When I read about this release, that a classically oriented pianist recorded a disk of improvisations, I said to myself, "I must hear this." After five listens I must say I am very glad I did. Ola Gjeilo's Piano Improvisations (2L 82) comes in a set--a version on Blu-Ray disk and the recording as a high-quality audiophile CD. I don't have a Blu-Ray player so I cannot tell you how that sounds, but the CD sounds terrific. It is an extension, transformation and fresh start using these and other original elements to create a full program of inspired pianism. There are a few composed pieces that sound well and then there are long passages of beautifully post-Lisztian, ecstatically sweet rhapsodizing. And it is very. very lovely to hear. Bohuslav Martinu (1890-1959) wrote many of his works in a signature style which, while original and instantly recognizable, had certain melodic-harmonic contours that gave them a certain similarity, nearly bordering on formula. Nonetheless virtually all of those works remain worth hearing and appreciating. However he also wrote music that was considerably distanced from those parameters. Today's disk contains four such compositions. What is at hand for our listening pleasure is a Naxos (8.572485) release by the Holst-Sinfonietta, Klaus Simon conducting and on piano, with Robert Hill as harpsichord soloist. The four works were written between 1927 and 1959 and so cover his entire career. They are works for chamber orchestra, each with a unique stylistic imprint. The Concerto for Harpsichord and Small Orchestra (1935) shows the influence of neo-classic period Stravinsky without a resorting to a direct imitation. It's jaunty and absorbing. Chamber Music No. 1 ("Les fetes nocturnes") (1959) has some of the neo-classic traits again, but this time there is more whimsy, contrast and a Bohemian folk dance feel to the music at times. Les rondes (1930) is in six short movements, has a syncopated feel and, again, middle-period Stravinsky as part of its heritage. The rendition of La revue de cuisine: Ballet du Jazz (1927) gives us the complete ten movements of the pivotal score. It's the most syncopated, jazz-influenced music of the lot. As we know, virtually all of the jazz-flavored works coming out of Europe and American from the '20s through '40s were not really quite "jazz" the way King Oliver, Sidney Bechet, Count Basie or Benny Goodman might have played it. Nonetheless there is much fine music to be savored, and La revue de cuisine belongs there with the best of them. In fact all four works are neglected gems. 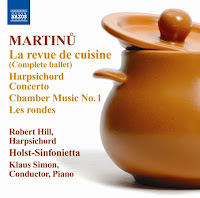 Thoroughly enjoyable, bursting with charm and dash, these are works that give us a Martinu not often encountered in recorded form. Maestros Hill, Simon and the Holst-Sinfonietta do an excellent job recreating the spirit of these works. It's the sort of brighten-your-day early-mid modern chamber music you will probably find yourself gravitating towards for many listens, if you are like me. Thoroughly recommended. Quite a few years ago when enrolled in an introductory ethnomusicology course it was my good fortune to be assigned R. Murray Schafer's The Tuning of the World, a most interesting book concerned with natural and artificial soundscapes, both local and global, and their symbiotic relationships. It's a book I've continued to reread over the years, very fertile ground for insights and creative catalysts, and a cautionary tale about the effects of our ever-encroaching industrial world on the sonic environment. Only in the last several decades have I gotten the chance to hear Schafer's music, the latest of which I am currently appreciating, My Life in Widening Circles (Centredisques 17712). 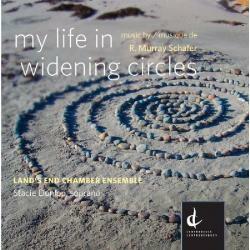 It's a series of chamber works ably performed by members of the Land's End Ensemble. Some of the Canadian composer's works presented here are inspired by natural soundscapes he has experienced in his life, some less so. Five works are represented, two song cycles and three instrumental chamber works. The song cycles have a dramatic aspect, with a rather wide dynamic range handled powerfully by the vocal soloists--almost too powerfully. Lyrics come out of Bertolt Brecht, traditional sources and Rainer Rilke. The music is bi-tonal at points, and highly crafted. The instrumental chamber works are perhaps the most successful, with the "Duo for Violin and Piano" standing out as a brilliantly elaborate essay in propulsive brio. The "Trio for Violin, Viola and Cello" is also quite captivating, with moments of starkness and great thematic beauty contrasted with passages expressing a strident aggressiveness. All the works are of interest. They are just idiosyncratic enough in subtle ways that getting a handle on them takes time. I am not quite there yet. They have a modern-pre-Darmstadtian cast to them in their own way, and they show the sure hand of a highly skilled craftsman. I need a little more time with this music to say more. For now I will note that they document the chamber side of the composer in revealing ways, that the performances are most dramatic and the music worth hearing by all means. Beyond that I will not venture for now. 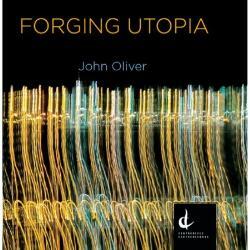 John Oliver, composer of orchestral singularities. His new recording of orchestral works, Forging Utopia (CMC 17612) makes it clear that Canada has a new voice, emerging full-blown to those of us who have never heard him. The National Arts Centre Orchestra under David Allen Miller, the CBC Vancouver Orchestra under Mario Bernardi, the Windsor Symphony under John Morris Russell, and the CBC Radio Orchestra under Jacques Lacombe give the four works quite respectable readings. The works define Maestro Oliver as a keenly sensitive vehicle for realizing massed, complex sounds. There are Ivesian collages and cacophonies, Messiaenic multi-stylistic contrasts, Zappaesque sarcasms, mysterious washes punctuated by sharp intrusions from various solo instruments, grotesqueries of great disparities, masterful use of mezzo-soprano Judith Forst (on "Unseen Rain") and a general musical narrative style that engages and immerses the listener in fantastic worlds. He orchestrates with some definite brilliance, making full use of the innovations and sonic possibilities that 100 and more years of experimentation and trial-and-error refinements have created, giving for him a legacy of artistic possibilities. And yet there is something about the music that shines, glistens and speaks in its own right as John Oliver and nobody else. Each of the four works has its own distinct mood and sound, with "Face in the Abstract" and"Raven Steals the Light" going the more dynamic, spectacular route. The latter is a good one to start with to get a feel for his reworking of 100 years of orchestral innovations and crafting it all into his own personal signature way of proceeding. This is new music with a capital /n/. It's an exciting program and it will provide many hours of enjoyment and exploration for those who seek the emerging voices of today. I hope we all can follow where he goes next in future releases. He is one of the most promising orchestral composers of today. Why is it that the two masterpiece symphonies from WWII were both written by Russians? I refer to Shostakovich's Symphony No. 7 and Prokofiev's Symphony No. 5, the latter in a new recording by Marin Alsop and the Sao Paulo Symphony Orchestra (Naxos 8.573029). There is no easy explanation, I suppose. We musn't forget how devastating was the Nazi invasion of Russia during the war. USSR soldiers gave their lives in huge numbers to repulse Hitler. The turning point of the war was most certainly centered around Hitler's strategic disaster. With the two-front war the Nazi's were doomed. And the Russians fought back with relentless will and courage. That still doesn't account for the magnificence of the symphonies. Of course Shostakovich and Prokofiev were at the prime of their creative powers, symphonists of marked originality, and the allied world needed (hard to imagine in today's cultural climate) symphonies of great, stirring power to rally around and to celebrate a musical analog of events. They most certainly got them. The fact is, masterpieces are masterpieces; they arise in circumstances that can be as variable as anything in life. Be that as it may, these remarks came to mind as I listened to Marin Alsop's vivid new recording of the 5th. It is a symphony of unforgettable melodic brilliance, harrowing and triumphant, powerful and tender, transcendent. It was conceived at a peak moment, 1944, when the tide had turned, and it captures the horror and brutality of the war and the joy of impending victory. Ms. Alsop conducts the Sao Paulo Symphony Orchestra with great elan. 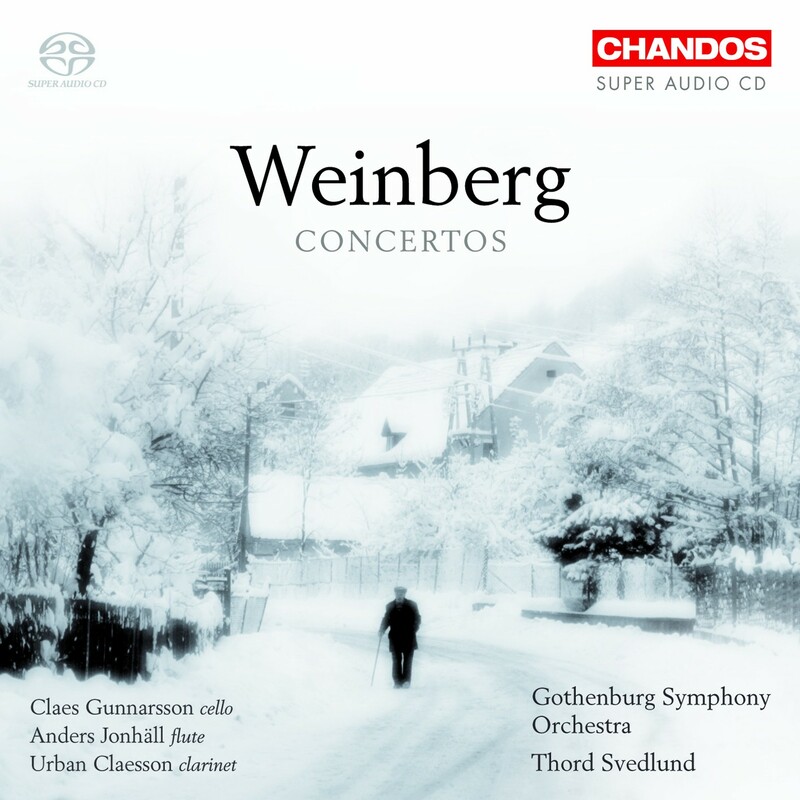 The broad sweep of singular themes, great drama, melancholy regret, stirring action, all are rendered with the attention to affect so necessary to do justice to this symphony's great power to move listeners. If I occasionally found that the balance of parts in the recording was not quite what I was used to hearing (I have a number of old LPs of this symphony)--the snare drum part in the fourth movement is felt as much as experienced, sometimes the secondary wind or string parts don't seem as forward in the mix as what I have heard--it is partially because the soundstage is closer in ambiance to an actual concert performance, that perhaps there was less in the way of close, multi-miking going on than in the classic high fidelity days. At any rate this is a version to turn to again and again with delight. It's very spirited and triumphant. 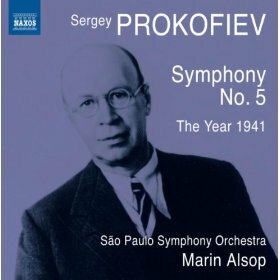 And the inclusion of Prokofiev's moving Symphonic Suite "The Year 1941" makes this a great choice, especially at the Naxos price. This is a symphony that grows in stature the more one hears it. A near-lifetime of listening to it convinces me that it belongs with the greatest symphonies of the past century. Do not hesitate to grab this disk--even if you already have a recording of the work. 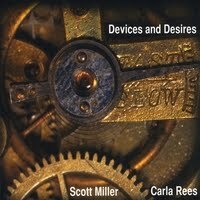 This morning something new out of the avant camp, a fascinatingly provocative series of composed, semi-composed and improvised duets from Scott Miller and Carla Rees, Devices and Desires (Rarescale 004). Carla Rees is a flautist of considerable accomplishment, playing with a wide variety of timbres in half, whole, quarter and micro tones. 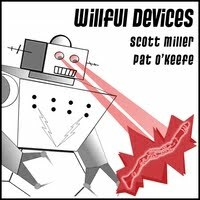 Scott Miller provides the interactive electronics with a considerable inventive flair and attention to complementary washes that have a lively, story-telling quality to them. The six works presented on this disc flow together well, as the flute and electronics parts create an evocative soundscape of sonic advancement. The CD results from a session between the two organized to record Miller's "Anterior/Interior". Things went so smoothly that there was time left to record a great deal more. From there the two created some remarkable free improvisations, firmly ensconced in the world of avant-new music rather than showing any influences of jazz per se, though there are times when the rhythmic pulse takes on a regularity and drive that relates as much to comtemporary vernacular as it does to Subotnik's classic "Silver Apples of the Moon." The result is music that has some of the innovative rigor of middle-to-late-middle-period Stockhausen, though the music has its own sound. An impressive collaboration that will appeal to the flute-lover and the lover of the new lurking within (I would hope) all of us. 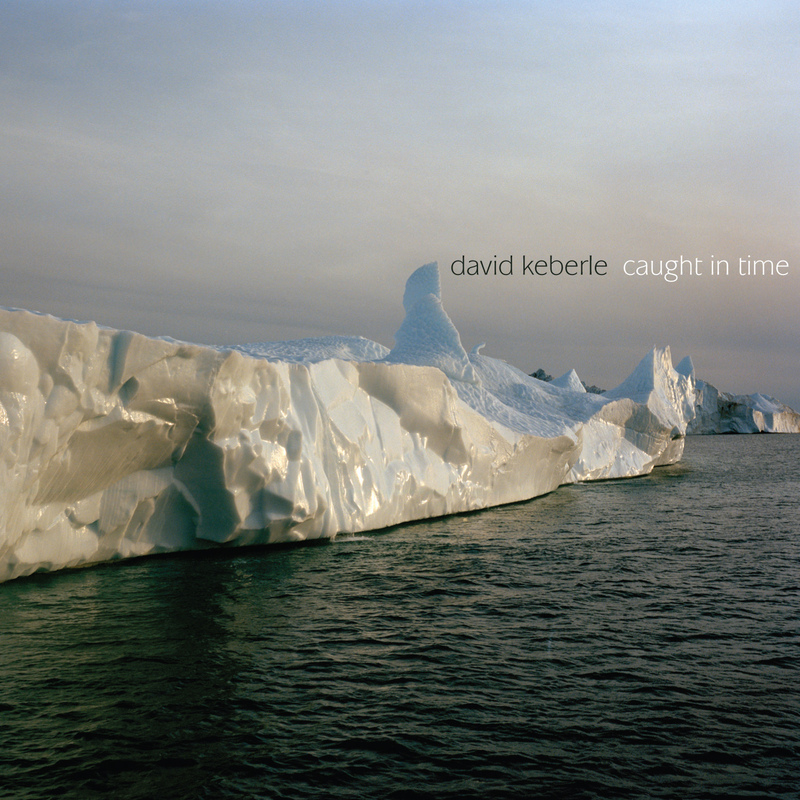 David Keberle, composer of music of brightness, beauty, contemporary in tone color, often lyrical in affect--all this you can hear vividly on his new album Caught in Time (Innova 807). "Soundings II" for Solo Flute & Flute Ensemble has a ravishing sonance and starts the program off auspiciously. The solo flute part is rangy with the skips, dynamics and timbre advances of the avant garde and the flute ensemble makes use of out-of-time cascades and other ultra-modern effects, yet the music is lyrically tonal. This is what the album is about--the presentation of pointilistic and colorful aural sonorities with the warmth of tonal expression. Keberle writes brilliantly for winds, as one can hear throughout. "Incroci," an extended work for clarinet and piano, shows this especially well. But his balanced writing style makes room for his vision of the brilliant blends of all instruments involved. The four-part "Four to Go," for example, has a natural flow and very appealing part writing for flute, clarinet, violin, cello, piano and percussion. His "Three Songs on the Poetry of Yeats" for Tenor and Piano shows that he is a sensitive composer of vocal music as well. Caught in Time makes clear that David Keberle is a composer of the upper tier, fashioning excellently crafted, memorable chamber music for today. It's worth the effort to get this one, without a doubt. I look forward to hearing more of his music. Modern music for virtuoso sax (soprano, alto, tenor and baritone), piano and computer is what you get on Howl (Innova 811). 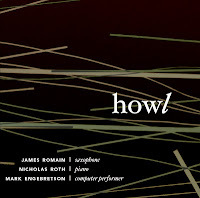 It's a series of short and multi-movement compositions featuring James Romain as new music/classical sax presence along with Nicholas Roth at the piano and Mark Engebretson as live computer performer. Each work is different enough that variety reigns. 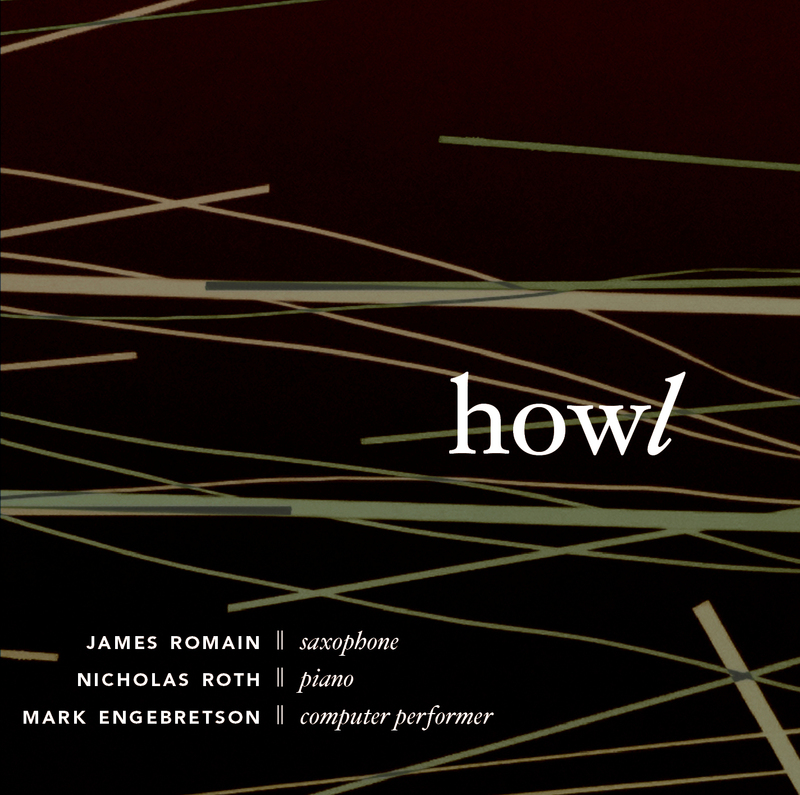 The works are by William Dougherty, Jianjun He, Eric McIntyre, and Engebretson, who contributes two short pieces. The emphasis is for the most part on the new music aspect of what is possible, less on jazz affinities, though there are some to be found (Anthony Braxton's example is somewhere lurking in the wings at times). Romain sounds very good, some pieces show a healthy experimentation, the use of electronics gives many of the works a broader palette than one would expect from a chamber ensemble, but for whatever reason (and I cannot pin it down) the sax-piano and sax-piano-computer music tended to engage me more than the passages with computer and sax alone. That's a personal issue perhaps and it has nothing to do with my opinion of the use of computers and electronics, as an even casual perusal of my blogs makes clear. None of it is dull. No one work jumps out as a masterpiece either. It is a definite feather in James Romain's cap.